Everything old is new again. Recent doll industry trends prove the truth of this adage, considering the popularity of reissued American mid-20th-century dolls and their outfits. Doll manufacturers are using old doll molds and original clothing for inspiration in the production of their current lines. 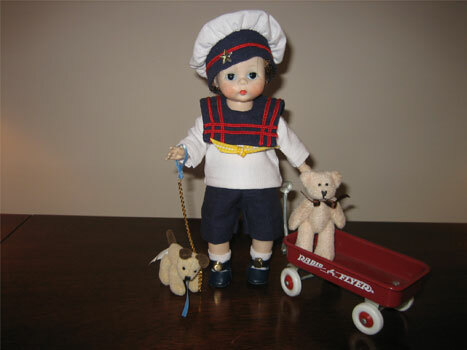 Reproductions of dolls, such as Vogue’s “Ginny,” Ideal’s “Toni,” Effanbee’s “Patsy” family dolls and Madame Alexander’s retro dolls, have all been quite popular in both the retail and the resale markets for several years. Perhaps the most interesting “old” trend is the reemergence of a doll clothes sewers’ cottage industry. By definition, a “cottage industry” is a system of commerce where the creation of goods and services is home based, rather than factory based. When most of the American population was involved with agriculture, farm families often used non-growing seasons to produce cottage industry goods as a means of supplementing their income. Although homemade products were often very beautiful and unique, the artisans faced difficulties in marketing and competing with factory-produced goods. With the onset of the Industrial Revolution and the rise of unions, cottage industries all but disappeared in the United States. However, in the doll world, there was one notable exception. Books and periodicals document that The Vogue Doll Co. used hundreds of home sewers spread through­­out several states to produce Ginny outfits. 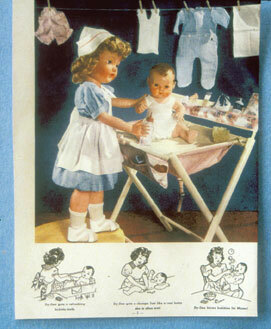 When Vogue Dolls ceased production in the United States, that domestic doll clothes sewing industry disappeared. 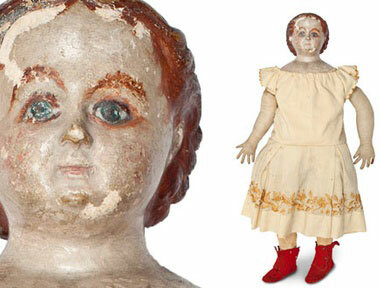 The manufacture of reproduction dolls, coupled with the greater availability of vintage and antique dolls through Internet auction sites such as eBay, have sparked the reemergence of home sewers. Now, a growing cadre of doll clothes sewers exist who are dedicated to producing faithful reproductions of vintage outfits for both original and reproduction dolls. The medium that makes this possible is the ability to direct-market the outfits to a large group of consumers through another cottage industry: on-line auctions. In effect, it is a goods-based cottage industry within a service-based cottage industry. Avid doll collectors who restore vintage and antique dolls will attest that often the hardest aspect of rejuvenating dolls is replacing missing, heavily worn or damaged clothing. 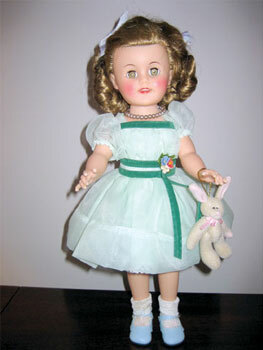 Optimally, collectors want tagged, documented, original doll clothing for their vintage dolls. But often these clothes no longer exist or are very rare and hard to find, making them prohibitively expensive. Then an alternative means of replacing the original outfits, one that remains as faithful to the doll’s era as possible, must be employed. When the quest for tagged original outfits becomes too lengthy or too expensive, savvy restorers and collectors turn to doll sewers. The women profiled here are a unique group who combine their love of dolls, incredible creative design ability and technical sewing talents to turn out gorgeous creations in doll-size miniature. All four seamstresses have been sewing since their childhood or early teens and later worked in professional capacities that involved sewing and/or design. Each of the sewers is capable of designing and cutting her own patterns and then sewing the garments with finishing techniques that either rival or surpass the mid-20th-century factory finishes. Often, the only tip-off that the outfit was made in a home setting (and not in a factory) is the sewer’s personal label. All of these women are capable of reproducing a vintage outfit from a photo if they have the correct doll and fabric on hand. When a likeness rather than an exact reproduction is desired, each has the aesthetic and technical abilities to make lovely design decisions for the doll owner. While these women market their creations on eBay, they have established clients through other venues as well. Muriel Carter, of Arden, N.C., enjoys sewing for many dolls, especially for those made in the 1950s. Carter comes from a self-described family of “needlewomen,” particularly her grandmother. As a 9-year-old, Carter started making clothing for her dolls by hand, followed by a stint in 4-H Club where she learned machine sewing. Carter then studied art and design in college. Later, while employed as a product designer for a small gift manufacturer, Carter used her training and talents to fabricate samples and create patterns used in the mass production of gift items. In the 1980s Carter owned a doll shop where she carefully researched and sewed outfits for dolls that were missing original clothing. Now sewing for the vintage Ginny and “Bleuette” dolls keeps Carter busy. Donna Johnson hails from Bend, Ore. Johnson credits her incredible sewing and patternmaking skills to instruction she received from her grandmother, mother and home economics teachers. In the 1960s she owned a dressmaking shop where she sewed bridal, evening and business attire. 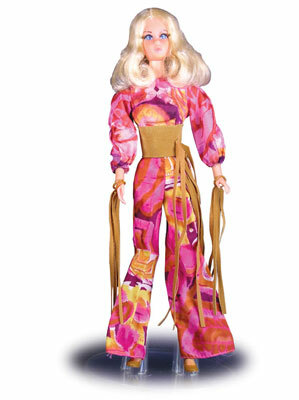 Johnson started sewing for dolls in the 1970s, and by the 1980s she was making outfits for a California doll shop. 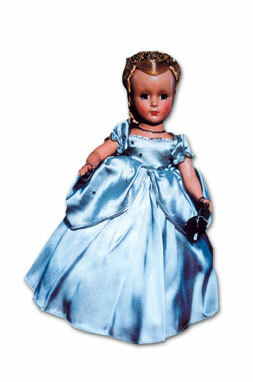 At about this time, her interest turned to Madame Alexander dolls because “the quality of these dolls and their outfits always amazed me.” Although Johnson sews for just about any doll, her recent creations consist mainly of the 8-inch dolls and the outfits that fit “Wendy Ann,” Ginny, and “Ginger.” A perfectionist, Johnson believes the inside of her garments should look almost as good as the outside—“not seen, but top quality,” she says. Carol Jacobs lives in Cape Coral, Fla., where she has a home-based design/sewing studio dedicated to dressing vintage and contemporary dolls. Jacobs’ love of fabrics, design and sewing was inspired by an aunt who worked in New York’s garment district as a women’s clothing designer. Jacobs’s college career started at The Fashion Institute of Technology in New York City. Although she ultimately opted for a liberal arts program, design continued to play an important role in her college life and subsequent career decisions. Jacobs’ professional sewing resume includes owning a home appliqué design business and a bridal and formal wear boutique. Carol also sells creations for a range of dolls on eBay. The variety of doll sizes and styles she sews is impressive. “Tiny Tears,” Ginny, 14-inch “Toni” and Wendy are some of the vintage “clients” Carol works with. Buyers praise her beautiful designs, excellent workmanship and attention to fine detail. Catherine Kauffman, of Danville, Pa., is a self-taught seamstress who started sewing on a treadle sewing machine at age 14 out of economic necessity. One of 16 children, Kauffman’s mother died when Kauffman was only 11. The family couldn’t afford extras such as dolls. As a teenager, Kauffman honed her sewing skills working in a pajama factory and later as a seamstress in a hospital laundry. Sewing for dolls came much later after her daughter was born. Now Kauffman makes approximately 40 “Shirley Temple” outfits, creating patterns from pictures of the original costumes. Brigitte from France owns three outfits and is thrilled with the faithfully detailed reproduction Kauffman made for her composition Shirley Temple doll. The sewers can be contacted via their eBay usernames: Muriel Carter (mlcsdollsetc); Carol Jacobs (alterations24u); Donna Johnson (kathy_gillispie); and Catherine Kauffman (logcabin5).